Clinton Wagman scores his second try for Selkirk against Edinburgh Accies (picture by Grant Kinghorn). 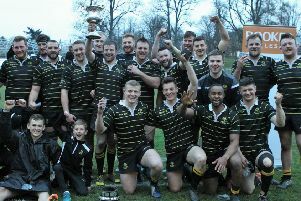 Selkirk’s rugby bosses are looking for ‘more of the same’ when they line up againt GHA at Philiphaugh tomorrow (Saturday). The Souters may have lost last week to table-topping Edinburgh Accies, but they delivered a points-scoring performance with good play, especially from the backs. Manager Tom Ramage said they had taken many good things from the visit to Raeburn Place, despite going down 29-15. He pointed out they had scored three tries to the league leaders’ four and added: “I’ll be looking for more of the same, because we are scoring points – although Accies are a really good side. “We are still looking to consodilate our position in the top four and I think it was a rogue result last Saturday, with GHA beating a weakened Gala side. Ramage said Selkirk’s back line was playing really well and their wide game was particularly good just now. “We just have to be more mobile and cut down the penalty infringements,” he said. “In the last two or three games, we have been giving too many penalties away, and it’s costing us points. Selkirk were without a couple of players because of midweek training injuries but hope to be back near full strength, with Jock Renwick, Mikey Davies and Darren Clapperton back in the mix. Selkirk got off to a great start against Accies when Clinton Wagman scored in the corner, after some excellent lead-up play from both forwards and backs. Edinburgh were ahead 12-5 at half time but Selkirk began the second half as they had started the first, with Wagman again scoring in the corner after some great team play. Arron McColm scored a late third try for the Souters, with ex-Philiphaugh player Clemont Lecour getting on the scoresheet for Accies.